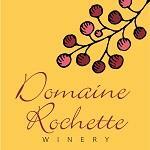 Domaine Rochette is a boutique winery , located on the Saanich Peninsula, North of Victoria. We enjoy a unique Mediterranean like microclimate, with dry summers and temperatures moderated by the surrounding Pacific Ocean. This allows us to produce food friendly wines with great varietal characteristics. We support environmentally friendly growing techniques, using integrated pest management. We currently grow Pinot Noir, Ortega, Marchael Foch, Schoenberger, Epicure, Petit Milo and one as yet un-named varietal. The wines are ready to drink when released so enjoy them young.